Winter seems to have a hard time letting go this year, shrouding D.C. in a drizzly gray as the Tidal Basin’s cherry trees hesitantly proffer florets. 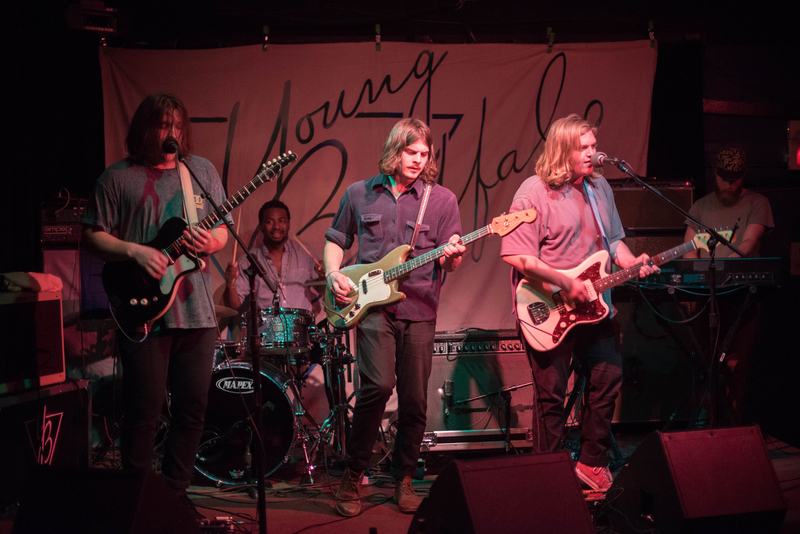 In the midst of the chill gloom, the shimmering energy and upbeat instrumentation that Young Buffalo brought to the Black Cat on Monday night felt just right for easing into sunnier days. 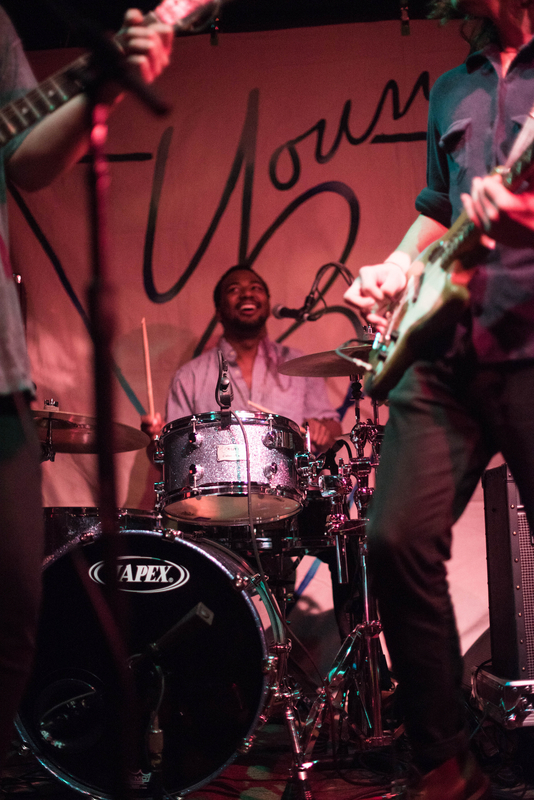 The Oxford, Mississippi-based group offers harmony-rich anthems and rock grooves sprinkled with synth lines, a sort of Delta Spirit-meets-the Strokes sound with an occasional bonus cover of Brian Eno. Originally a duo, Ben Yarbrough and Jim Barrett started writing music together as teenagers. The band now also features drummer Tim Burkhead, bassist Andrew Guinn, and keyboardist Will Eubanks. Earlier this week, Jim Barrett answered a few questions via e-mail about musical influences, favorite authors, and tour life. First off, I’m really digging the new album. Was this your first time working with Dave Schifmann [Haim, Weezer], and what was that collaboration like? This was, and he was the best! He has such a great sense of pop with the hooks and big choruses, but he wasn’t at all opposed to going off-course a little and trying something strange. He was open to anything and really put us in a beautiful place creatively. We hope we can work with him again in the future (LP2 maybe?). 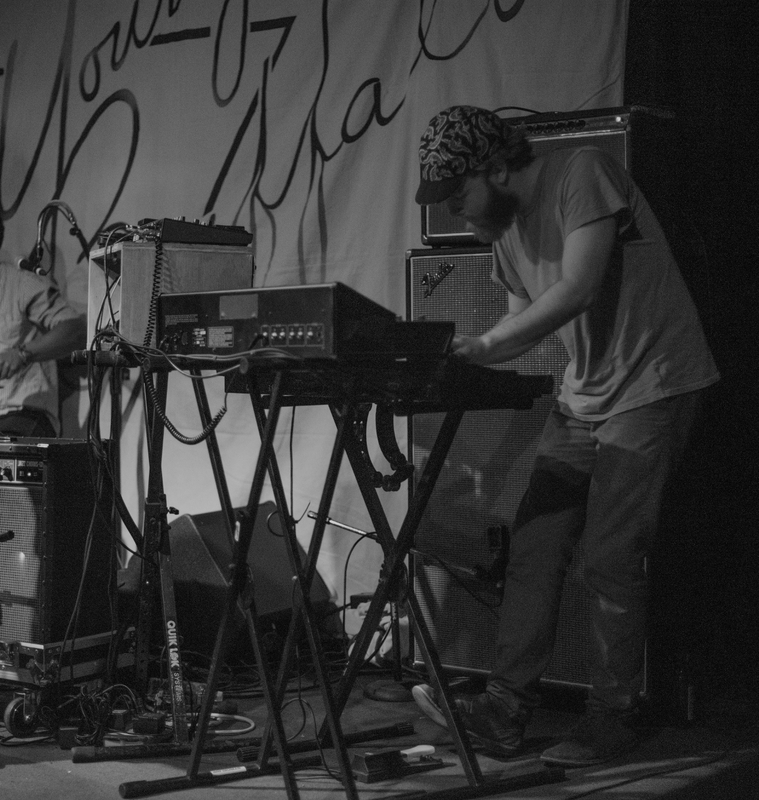 Young Buffalo at the Black Cat (Washington DC) on April 6, 2015. The music vid for “No Idea” is charming — I totally wanted a robot bff when I was a kid. Was the concept for the video something you guys came up with, or did it originate with the video team? The video team came up with the concept. We saw the treatment and told them to go for it. I remember flipping through it and knowing that it would completely fit that song, and it did! I’ve read that the name for the band has its genesis in a nickname that you had for Ben growing up. What’s the story behind the nickname? It was really just a random thing. I wouldn’t even call him Young Buffalo to his face…just to text him to see if he wanted to hang out or play music or something. Not such an interesting story unfortunately! I did end up using it for some of my songs I was recording in ’08-’09, most of which would become YB songs, and we adopted it for our three-piece band when we had shows booked but were without a name. Which artists/records have made a big impact on you through the years — can you think of favorite records from when you were, say, 10, 16, and 22? 10 — Can’t think of a record, but Beach Boys’ Surfin USA and Cecilia by Simon and Garfunkel. Also, Doobie Brothers’ Greatest Hits. 16 — The Strokes’ Is This It? Sonic Youth’s Daydream Nation and Neutral Milk Hotel’s In The Aeroplane Over The Sea. 22 — Tame Impala’s Lonerism. Which artists/albums have you been listening to lately? Tobias Jesso, Viet Cong, and Broncho a ton!! We saw them at SXSW and they were so good. Will Eubanks of Young Buffalo. You come from a town with a lot of literary history. Do you have favorite authors/poets/playwrights? What was the last book you read? Ben’s favorite local authors are Larry Brown, Barry Hannah, and Jack Pendarvis. The Curious Incident of the Dog in the Night-Time [by Mark Haddon] is the last book Ben read. I love Hemingway, Vonnegut and Bukowski. Love some Pablo Neruda poems. I’m currently reading A Man Called Destruction: The Life and Music of Alex Chilton by Holly George-Warren. I’m always curious about tour life — while it seems mysterious and glamorous from the fan side, from the performer side, it’s probably more like miles of trials and adventures. What’s the craziest thing that’s happened to you on tour? Who does the driving and who does the DJing when you’re on the road? We all split duties driving and DJing, although Ben is probably the best road DJ. He’ll dig up some classics when you least expect it. What’s your favorite watering hole in Oxford, MS? And do you have a favorite place to hang out in D.C. before or after shows? City Grocery on the Square in Oxford is our collective favorite spot probably. It’s where we always hang and drink when we go out. It’s historically had a great clientele of artists, musicians, and writers through the years. [As for D.C.] — I don’t know if we have one. We should play in D.C. more! D.C. hopes you come back before long, fellas — let us know if you need a bar or restaurant recommendation the next time you’re in town! 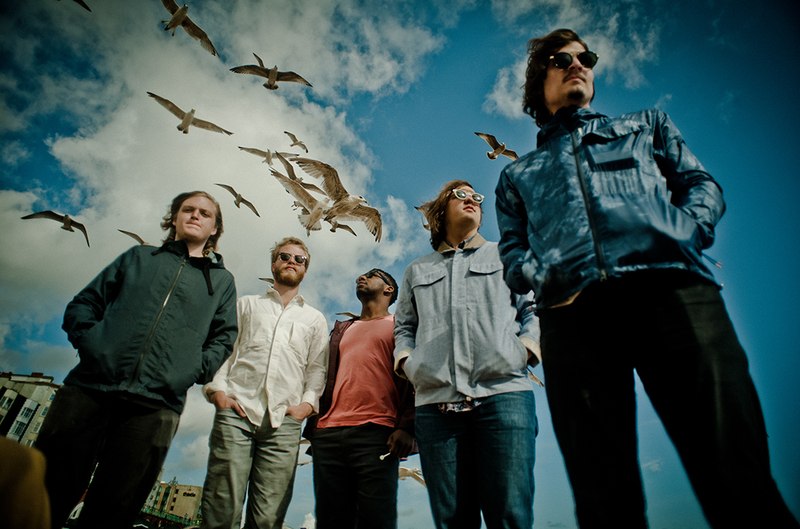 Check out Young Buffalo when they come to your hometown. The tour schedule is on their website, and grab their new album before you hit the road for spring break (iTunes). Thanks to the band for taking the time to answer questions while on the road and to Abby (Girlie Action Media) for setting up the e-mail interview! Previous Previous post: Jamie Cullum: An Interlude in D.C.